One month ago – on Sunday, June 3rd, 2018 – we hosted our fifth annual Bridal Open House, and to say that we are still daydreaming about the pure magic of the show would be a huge understatement. Aside from the insanely gorgeous displays throughout our venue and the impressive list of participating wedding vendors, we were blown away by the outpouring of interest and support from past, present and future couples. This year we saw pre-registration soar above normal numbers, and we were able to connect with over 200 attendees in person on the day of the show! Guests of the Bridal Open House were welcomed into the show through the Ballroom entrance, which was draped in layers of romantic white sheers by Above & Beyond Event Design. When creating our vision for this year’s event, our goal was simple – to inspire. We wanted to transform our spaces in ways that our followers hadn’t seen before, but also create looks that could stand the test of time. We partnered with two of the best teams in the industry – Above & Beyond Event Design (our preferred decorator) and Lyric Flowers (our preferred florist) – who graciously sponsored our event and brought our design dreams to life. 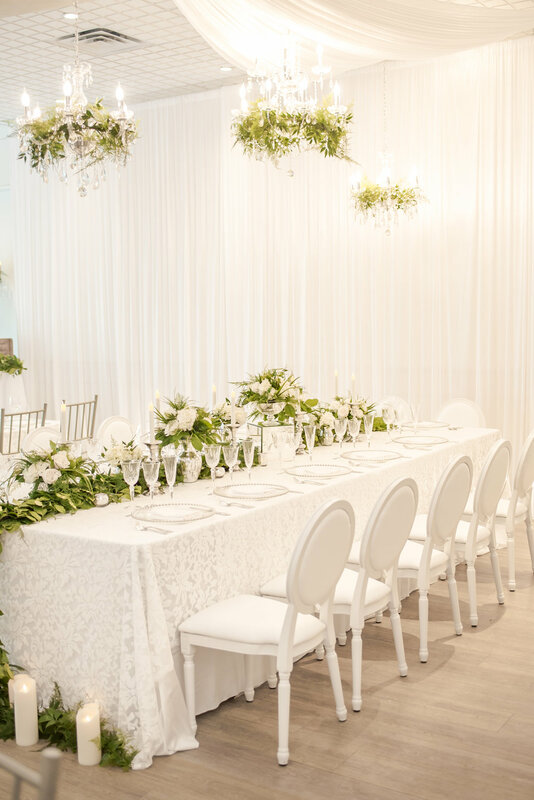 Even before The Duchess of Sussex put the all-white wedding back at the top of every bride’s wish list, we have dreamed of seeing our Ballroom elegantly styled in floor to ceiling white. We very much focused on a look of translucence, which is a huge trend for 2018, but also completely timeless. Details like the white colour scheme, glass and acrylic décor, mirrored and silver accents, and hints of crystal all play into the ethereal and airy vibe brides are lusting after this season. Set against a flowing white backdrop, the elaborate king's table display in the Ballroom included everything from a lush greenery runner, crystal chandeliers and stemware, to the ever-classic white Louis XVI dining chair. 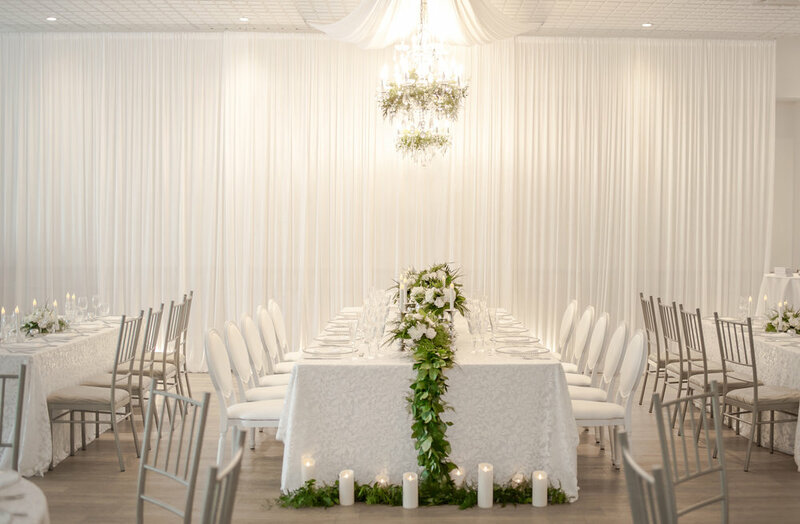 Running with the monochromatic look, Above & Beyond dressed the entire room in flowing white drapery, including a dramatic entryway created from layers and layers of heavenly sheers. At the center of the space was a king’s head table setup, where the bride, groom and wedding party would sit for a reception – intimately seated amongst the guests rather than against the backdrop wall. Included in the enchanting tablescape were rented crystal glassware, glass charger plates, mirrored risers, pillar candles in silver candlestick holders, and lace-embroidered linen. Hanging above the head table were various crystal chandeliers and a draped canopy, which added to the drama of the design. For additional visual interest, we opted for classic all-white Louis XVI dining chairs (rented), which perfectly complimented our champagne-toned Ballroom Chiavari chairs that were placed at mock family and guest tables. As well, the layout was made up of a mix of long and round tables, providing a thoughtful aesthetic that we very much encourage our couples to consider when we draft up their personalized floor plans. Lyric Flowers elevated the Ballroom design with an abundance of white floral and greenery, arranged in low mercury dish centerpieces, raised in glass urns, and laced through chandeliers. Guest table displays in the Ballroom were just as beautiful as the king's table, dressed with coordinating lace-embroidered linen, glass and mirrored details, and loads of candlelight. Of course, every inspiring wedding design wouldn’t be complete without the perfect florals. In keeping with the romantic feel of the space, Lyric Flowers incorporated an assortment of white florals and lush greenery in mercury centerpiece vessels and large glass urns, laced through chandeliers and candelabras, and as a striking live runner down the center of the king’s table. Floral varieties such as hydrangeas, peonies and garden roses were paired with eucalyptus to achieve a textured, elegant look. Our flatware, stemware and glassware completed the table settings and added the finishing touch to the reception space. Knowing how polished it is continue the design story through every aspect of the event space, we extended the look to a lounge area that would be multi-purpose for weddings – guests would be able to utilize the space for conversation and photo opportunities, and the lounge could either be setup indoors (as we did at the show) or outside on the Ballroom private patio. Along with the tufted white leather couches and inviting fireplace display provided by Above & Beyond, Lyric Flowers accented the candlescaping and custom mirror sign with flowing greenery and floral. 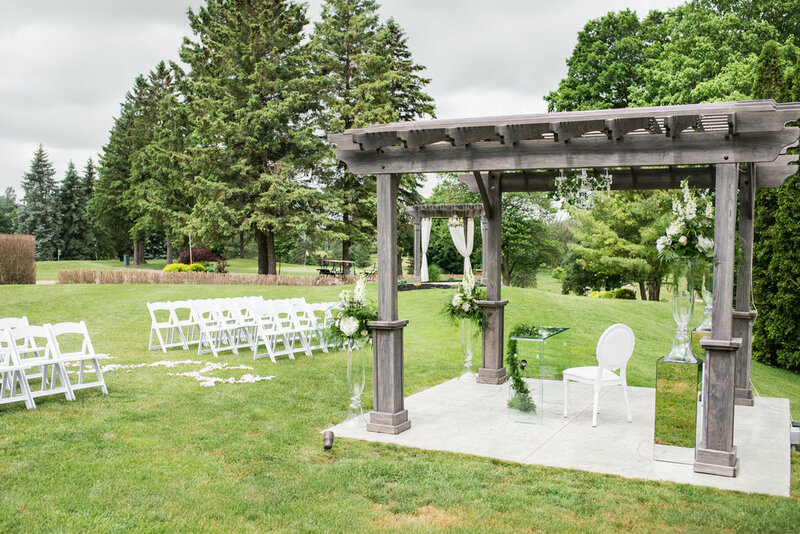 Additionally, we carried the romantic vibe outdoors to the two ceremony pergolas that belong to the Ballroom. Complete with shimmering crystal chandeliers, a ghost signing table, floral and greenery arrangements in large glass urns, a ceremony sign to match the one in the lounge, rose petals sprinkled down the aisle, and our white garden chairs, we were tempted to encourage couples at the show to exchange their vows that day! Truly, it would be hard to imagine a dreamier setting. In addition to inspiring attendees of the Open House to setup intimate conversation areas or photo backdrops at their own wedding, the ultra-dreamy Ballroom lounge also provided the setting for our Real Bride Panel to provide words of wisdom to future couples. The elegant ceremony setup at our Ballroom pergola proves that classic details like white garden chairs and a rose petal aisle will always be a beautiful choice. The look of translucence is one of our favourite trends of the 2018 season, so we chose to accent the ceremony setting with an acrylic ghost signing table, glass urn flower arrangements raised on mirrored pillars, and beautiful crystal chandeliers. Both the ceremony and signing Ballroom pergolas were dressed with matching crystal chandeliers, courtesy of Above & Beyond Event Design. Next door in the Hideaway, we ran with a secret garden theme, with the space dressed in shades of champagne, off-white, peach, burgundy, and loads of greenery accents. We opted for a unique head table layout in this reception space as well, with the couple of honour intimately seated at a sweetheart harvest table, under a gorgeously draped private chuppah. 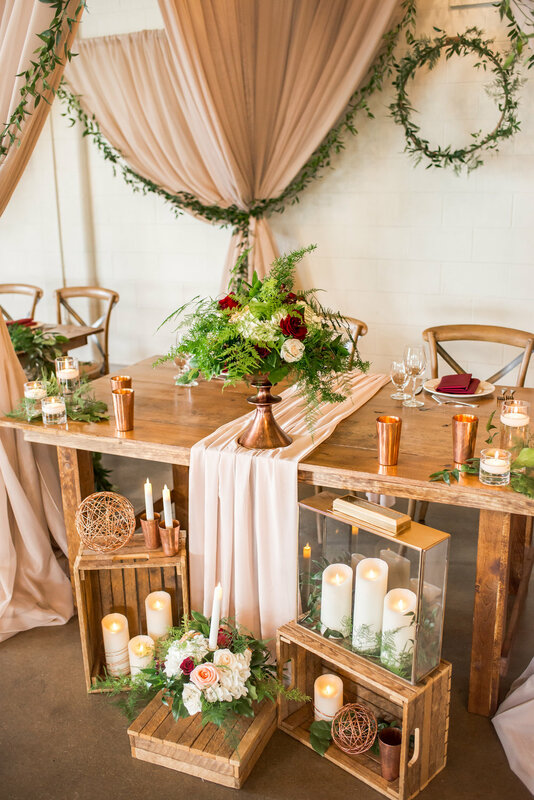 As a natural extension from the bride and groom, Above & Beyond extended the draping out behind harvest tables that could easily serve as family or wedding party tables. Additionally, the sweetheart table was dressed with a runner in matching champagne chiffon, which romantically flowed down from the centre of the table and puddled at the floor. 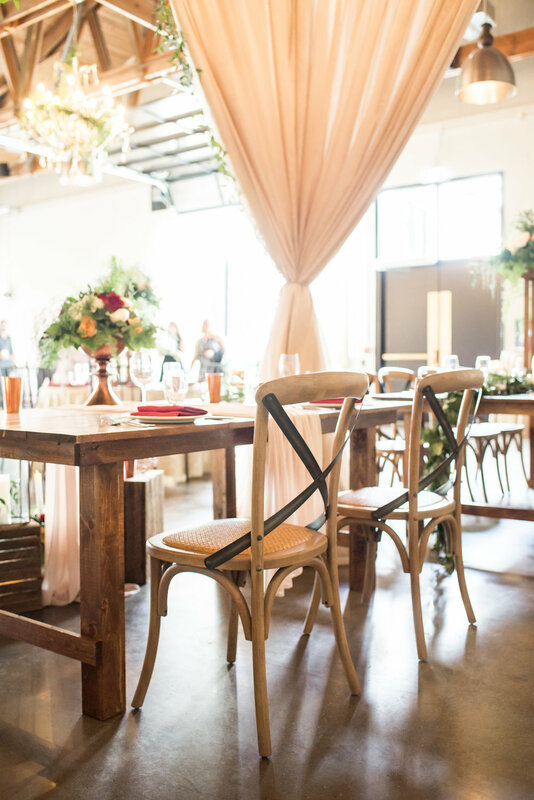 For seating, Hideaway vineyard chairs were placed at all of the wood tables, and our dark-framed Chiavari chairs were set at all other guest tables. 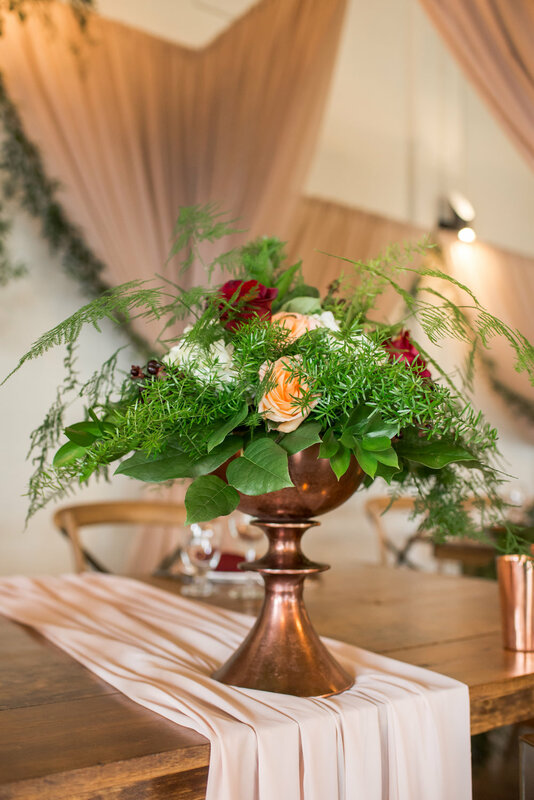 When it came time to accessorize, Above & Beyond used pretty details like copper flower vessels, gold candleholders, glass lanterns, and lucite table numbers to balance the rustic vibe of the tables, chairs and room itself. Inspired by a secret garden theme, the Hideaway design included details that were at the same time polished and undone. A stunning draped chuppah, greenery accents and bursts of floral everywhere, and wood tables and chairs elevated the space perfectly. An intimate sweetheart table was set beneath the chuppah at the center of the Hideaway design, with romantic accents like a flowing chiffon runner, greenery wreath and garland, and a multitude of candlelight. To add to the garden theme, Lyric Flowers finished the champagne draping with greenery garland, hung a greenery hoop behind the bride and groom (a popular trend for this wedding season), placed a greenery runner down the centre of wood tables, and wove greenery through all the chandeliers in the room (existing and those installed just for the event). As well, wispy foliage and greenery, such as classic Italian ruscus, was organically arranged with roses and ranunculus to create oversized centerpieces for the guest tables, which were raised on wooden casbah stands – a design that both complimented the garden feel and tall ceilings in the space. Another guest lounge was setup in the Hideaway to provide couples of the Open House with a different idea for a photo booth at their wedding. Here they could also chat with two of our past brides about their real wedding experience. Similar to the Ballroom, our event design in the Hideaway didn’t end with the reception floral and décor. A lounge area was arranged to serve as both a beautiful backdrop during speeches (behind the podium), and then a photo backdrop for guests to use during the dance party. 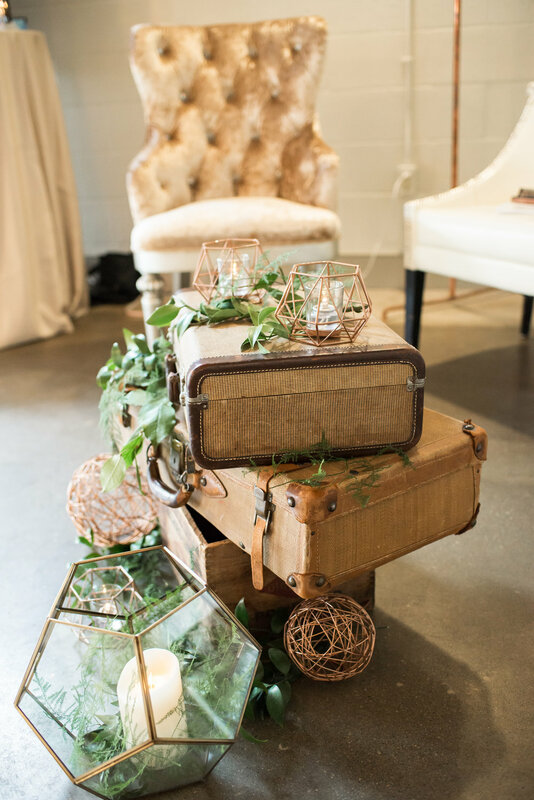 Outfitted with a love seat, two velvet wingback chairs, and charming accents – such as vintage suitcases stacked to create a coffee table and glass terrariums filled with candles and greenery – the lounge was designed to perfectly compliment the look of the head table. Extending the design to the outdoors, Above & Beyond arranged the ceremony pergola with rented wooden crossback chairs for guest seating, and a vintage chair and table for the signing of the register. 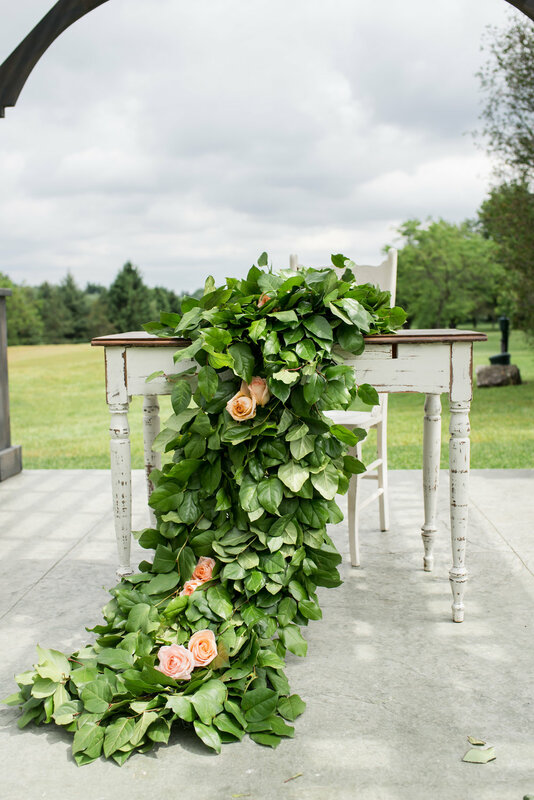 Aside from Lyric Flowers adding a flowing floral and greenery runner to the signing table, we left the arbour in its organic state, which allowed the beautiful surrounding natural landscape of the golf course to work its magic. 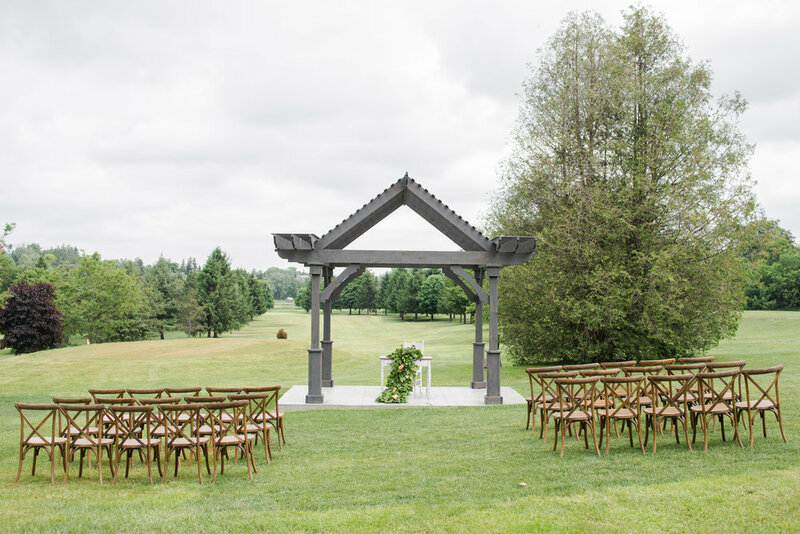 Allowing the natural beauty of the surrounding landscape to shine, we simply and organically styled the Hideaway ceremony pergola with wooden cross-back chairs and an antique signing table. 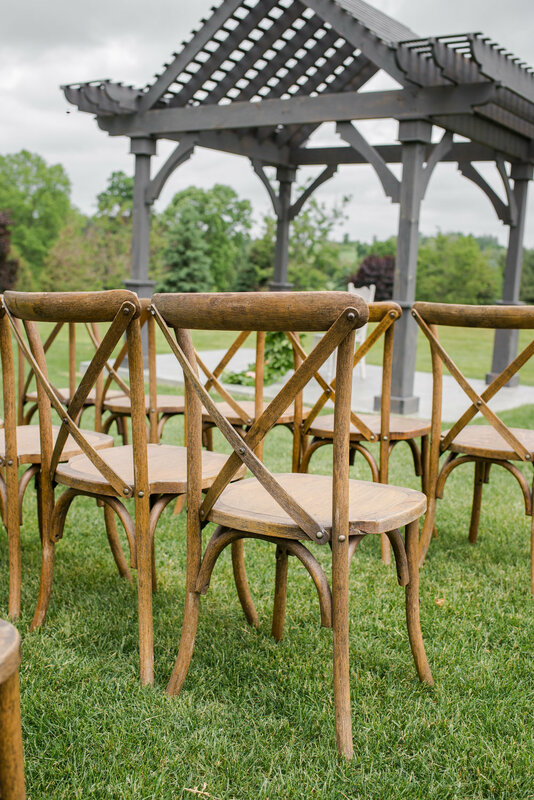 Just when we thought that wooden harvest benches were our favourite rented seating option for the Hideaway ceremony grounds, these gorgeous vineyard chairs came in and stole our hearts. Apart from the inspiration couples draw from the show designs, the purpose of our Bridal Open House is for brides and grooms to check off many of the boxes on their wedding planning list. Our in-house Event Team was on-hand to provide tours and answer questions, and a curated selection of our trusted vendors – decorator, florist, photographers, disc jockeys, officiants, bakeries, makeup artists, bridal registry, and transportation – were available for couples to personally connect with. 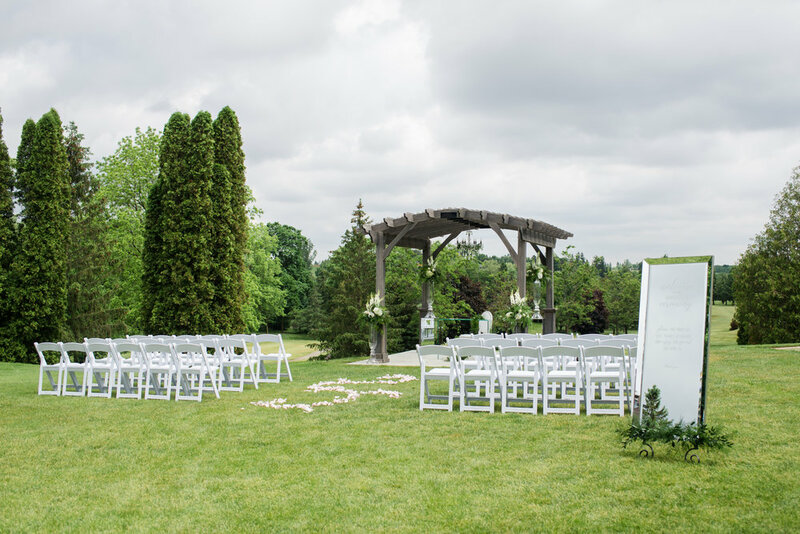 Pelee Island Winery provided attendees with wine samples of all the varieties they would be able to choose from for their big day, and Cowbell Brewing Co. topped off the bar selection with beer samples. Not only did we cover off the beverage category, but we also satisfied the taste buds of our guests by offering a selection of our finest passed hors d’oeuvres, plus a sample of one of the hottest late night station options of the moment – donuts! Additionally, our three preferred bakers – The Cake Box, Cakes by Julie, and Gimme Homemade Treats – rounded out the food offering by providing guests with samples of their baked goods. See the full list of participating vendors at the end of this post. This year, we also added another fun way for couples to envision what their experience at our venue (and with our preferred vendors) would look like – via a panel of real brides! Four of our past brides – two Ballroom brides and two Hideaway brides – were available for couples to chat with and gain words of wisdom from. Each bride even had a photo book of her wedding handy, so that couples could flip through to reference or simply for inspiration. And attendees really loved this new segment, as we received numerous rave reviews about the real talk had with our real brides! See more from our real brides at the end of this post. Our Event Team was on-hand at the Open House to provide tours of our spaces and answer any preliminary questions couples had. From left, Courtney Ordway (Special Events Manager), Matt Staffen (President & General Manager), Ashton Staffen (Director of Special Events), and Taryn Scripnick (Special Events Supervisor & Maître D'). Thank you to all of the amazing couples who visited us at the show, our vendor partners who invested so much time and energy, show sponsors Above & Beyond Event Design and Lyric Flowers for their beautiful displays, the one and only Nina Polidoro for always gracefully capturing the feeling and beauty in every moment, our panel of real brides who have become a part of our family, and our staff who always work so tirelessly to deliver an unforgettable event. Each and every one of you contributed to the undeniable success of this show, and we cannot express in words how grateful we feel for the support. We look forward to all of the beautiful weddings we will host this season and beyond!